Canon Professional Network has published an informative article highlighting the PowerShot G16's key features, benefits, technologies and specifications. Adorama has the Canon PowerShot G16 available for preorder. 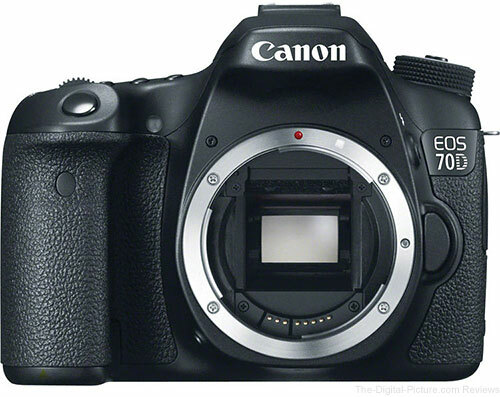 Canon EOS 70D results have been added to the site's Image Quality tool. These results show the resolution of the 70D's sensor along with the base level of sharpness Canon has dialed in. The IQ tool link above will load a comparison to the Canon EOS 60D. The 70D is looking very nice against the 60D with just-the-right amount of improved sharpness. Increasing sharpness *can* increase noise levels. I'll have that comparison available for you soon. 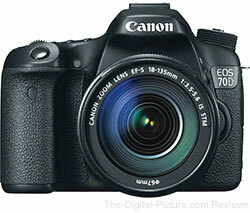 The other 70D comparison I find interesting is against the Canon EOS Rebel T4i / 650D. I find the T4i images to be slightly oversharpened even with a very low sharpness setting of "1". Look for the halos and jagged edges around the black details in the T4i's ISO 12233 chart test results. The 70D results, again, look just right. And, there is a noticeable resolution increase in subjects with fine details. Photoshelter is offering a free guide - Growing Your Portrait Photography Business: Part 1. The first installment focuses on families, kids, and high school seniors. Created for imaging enthusiasts and professionals eager to learn new techniques and get expert advice on a variety of topics, the revamped Canon Digital Learning Center (CDLC) Blog offers the insights they seek. Expert contributors such as Explorers of Light, and Canon Technical Specialists and Advisors, show what the CDLC has to offer firsthand via weekly blog posts. Recent topics include field reports from Canon Live Learning events, protecting camera gear from summer elements, dissecting an EOS C500 Steadicam rig, and a little-known LP-E6 battery management trick. New York, New York - August 28, 2013 - Adorama, one of the world’s largest photography, video, imaging and electronics retailers, recently launched its brand new photography diffusion and accessories line, Glow by Flashpoint. Adorama’s brand new line of professional studio and on-location lighting modifiers employs advanced technology designed to create perfect editorial and product still life images. Glow by Flashpoint offers softboxes in varying shapes and sizes, including the Grand Softbox in two different sizes, and unique HexaPop products, which combine the flattering diffusion of a softbox with the soft focused light from the reflective, curved surface of an umbrella. All Glow lighting accessories are completely heat resistant and are designed with superior construction and materials, including a super-strength, silver, gridded fabric lining the interior surfaces of the box that adds a crisp quality to the output. Made in Korea, these new lighting accessories from Adorama are available now exclusively in the Adorama store, located at 42 West 18th Street in New York City, and online at Adorama.com at highly competitive prices. The Glow Strip Rectangle - R Series Softboxes are specifically able to isolate the glow effect, not only used as a directional soft light source but as a specialty rectangular shape in reflective and translucent objects. 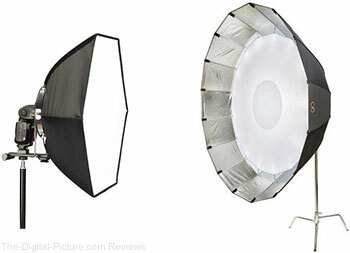 This unique, oblong softbox comes in three different sizes - 12” x 36”, 16” x 48”, and 30” x 60”. Each of the Glow Strip Rectangle Softboxes creates a tower of light that limits coverage to create a more dramatic effect. They are ideal for photographing people in isolated light treatment where controlled contrast is desired, when working with glass and metallic objects, and when sharper fall-off occurs. Glow Rectangle - R Series Softboxes are designed as the softbox standard for studio and location situations where diffused light is desired. A mainstay for any photographer’s lighting kit, these rectangular softboxes are available in three different sizes: 24” x 36”, 36” x 48”, and 40” x 56”. The remarkably even light covers larger objects in a still life setting and creates smooth fall-off effects when used as an overhead light bank on a boom. The Glow Rectangle - R Series Softboxes from Adorama are also great as a rectangular shape in reflective and translucent objects. Adorama also offers the Glow Square Softbox - R Series, a prime “harder” soft light for studio and location shooting where diffusion is desired but richer contrasts suggest more direct lighting. While rectangular softboxes create a more “open window” look, smaller banks focus more intensity into the scene - making the 28” x 28” square softbox from Glow a must-have lighting solution for any photographer. The ultimate one-source “people” light, the Glow Softbox Octo - R Series combines the strength of a portrait key light while acting as a soft wrap, blending perfectly with additional fill soft lights. Available in three different sizes - 24”, 36” and 60” - the highlight/shadow ratio of Adorama’s octagonal softboxes is optimized with a concentrated focus of illumination from the special bowl reflector and reverse umbrella design. The smallest of the bunch, the 24” adds slightly more “pop” to contrast due to its tight reflector spec, while the 60” is an optimal tool for mastering on-location shoots, imitating natural light. Glow by Flashpoint products are now available in the Adorama store, located at 42 West 18th Street in New York City, and online at the Adorama website. Visit Adorama.com to learn more about pricing and availability. Adorama has the Asus Google Nexus 7 Travel Cover (light blue, light gray & pink colors for the original Nexus 7) available for $2.99 with free shipping. New hot shoe to miniphone (HSFM3) cable allows photographers to connect any speedlight style flash to a PocketWizard radio, whether it has a PC port or not. So. Burlington, VT - August 27, 2013 - LPA Design, manufacturers of PocketWizard Photo Products, announces the immediate availability of the new hot shoe to miniphone cable (HSFM3). This three-foot cable, which has a basic (non-TTL) hot shoe on one end and a mono miniphone connector on the other, allows photographers to slide any speedlight style flash into the shoe to avoid using the sometimes unreliable or missing PC port. The miniphone end plugs into either a Plus radio (PlusX, Plus III, Plus II or Plus Receivers), MultiMAX Transceiver or FlexTT5 Transceiver. With another PocketWizard radio on the camera, photographers now have the most reliable triggering setup possible. "This cable has been long overdue in our line,” says Dave Schmidt, Vice President of Sales and Marketing for PocketWizard. “There are several flashes on the market that skipped the basic PC port making this cable a necessity and the PC port is not known for its reliability. This high-quality cable will provide the connectivity and reliability photographers expect from PocketWizard,” Schmidt added. Other features of the new HSFM3 include a 1/4-20 socket below the hot shoe, gold plated contacts and robust design to ensure reliability. Also available is the new locking PC to miniphone adapter (MPCF-L). This handy adapter allows users to convert any cord with a PC connection into a miniphone connection. 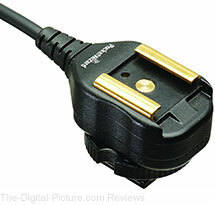 Amazon carries PocketWizard's new hot shoe to miniphone cable. 08-27-2013 - JP Distribution is excited to announce the introduction of the New SkyLux by Westcott. The first daylight-balanced Studio LED with a CRI Rating of 94+ that allows photographers to utilise their favourite modifiers with the addition of a single Bowens Mount Speedring. The SkyLux is a beautiful full-colour spectrum of light, housed in a high-quality compact all-metal unit, which embodies a unique design with a flat front panel to protect the LED light source (meaning, there’s no protruding bulb or globe to shatter). The durable construction allows photographers to utilise their largest modifiers, like the Westcott 7’ Octabank. The Bowens S-Type mount allows for the usage of softboxes, umbrellas, snoots, barn doors and gels. Unlike units utilising halogen or tungsten bulbs, the SkyLux gives off little heat with its unique LED design and has a lifespan of over 50,000 hours. Photographers will find an internal fan to keep the unit cool with virtually zero sound while in operation. The quiet fan and flicker free LED technology is a perfect setup for videographers. 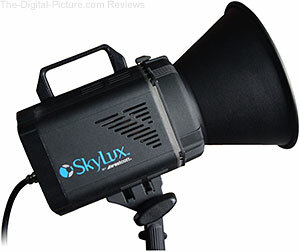 Adorama carries the Westcott Skylux LED Studio Light. Despite the pressure to turn over your work’s rights for less and less money, you can actually use technology to track and monetize your copyright. On Tuesday, we posted about the 5D Mark IIIs with Magic Lantern pre-installed available for rent from LensRentals. The cameras ships with a 1000x memory card and enable users to capture amazingly clear RAW video. On Thursday, Canon announced four new PowerShot cameras - the G16, S120, SX510 HS & SX170 IS - and a special edition Facebook-ready PowerShot N. Canon’s new top-of-the-line PowerShot, the G16, has been updated with a DIGIC 6 processor, improved AF, shorter lag, and built-in WiFi connectivity. Also on Thursday, Canon announced the EF-S 55-250mm f/4-5.6 IS STM lens. Building on the popularity of the previous 55-250mm consumer zoom, the new lens features an improved AF system, reduced chromatic aberrations, and Canon’s stepping motor for reduced AF noise in video mode. On Monday, Bryan posted an atypical review for the site - the Toshiba KIRAbook 13. In short, Bryan liked the laptop’s cutting-edge speed, dense screen resolution and out-of-the-box color calibration. Check out Bryan’s review for more information. Also this week, Bryan sent out the site’s inaugural newsletter and announced a giveaway. Anyone who signs up for the newsletter, or is already on the distribution list, will automatically be entered to win a Think Tank Photo StreetWalker HardDrive Camera Backpack. The newsletter will include review updates, new product announcements, prize giveaways, picture explanations, and exclusive deals. If you’re interested in getting the newsletter, or want to enter the camera backpack giveaway, look for the signup box located above the menu bar on the site. On Tuesday, we posted an eBay deal from 47th Street Photo where you could get a Sigma 35mm f/1.4 DG HSM “Art” lens for $779.00 with free shipping [deal has expired]. That’s a $120.00 savings off the normal retail price. Where Was Bryan Last Week? I took a Pelican case full of gear for a 2-day road trip last week. This area was severely impacted by Hurricane Sandy last year, but the recovery effort has been remarkable. 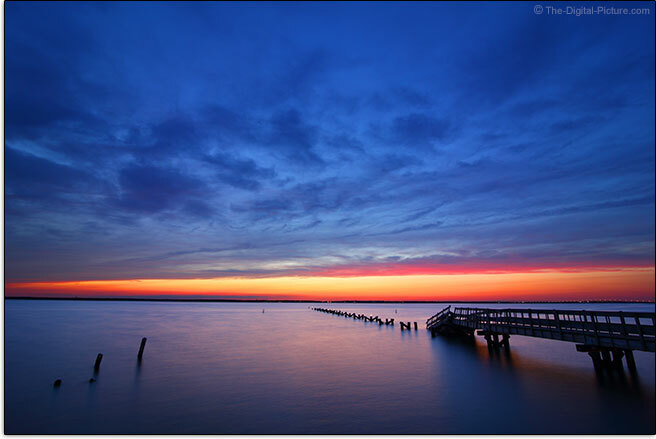 Repair of the unfortunate Barnegat Bay pier shown above was obviously remaining on the to-do list. This image is a 2-frame composite. I was able to hold adequate highlights and shadows in a single frame, but using a 2+-stop overexposed frame allowed for a much better motion blur of the water. The two images were processed in DPP (the longer exposure was darkened 2 stops) and then stacked in Photoshop where the lower portion of the shorter-exposed top layer was deleted to let the water show through. Watch for a review of this 16mm-capable full frame lens. Permalink: Where Was Bryan Last Week? Email Newsletter – Sign Up Now for Giveaway! These newsletters will not be as all-encompassing as the site's news page/feed, but may include additional features and information. 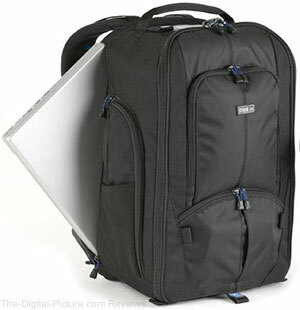 Think Tank Photo is generously providing an awesome StreetWalker® HardDrive Camera Backpack for the first newsletter giveaway. The first winner will be randomly-selected from the entire email registration list just prior to the next newsletter being sent. Simply signup for the newsletter for your chance to win! Sign up now. Enter your email address in the form below (or at the top of any page on the site if this form does not display/function properly in your feed reader). It is easy to unsubscribe later if you change your mind. Permalink: Email Newsletter – Sign Up Now for Giveaway! Join us for a streaming event featuring the best and brightest pro photographers. Connect with the masters in real time! Broadcast over six days, creativeLive Photo Week is one of the most ambitious events the photography industry has ever seen. Featuring over 40 instructors across three live channels, creativeLIVE Photo Week peels back the curtain on the glamorous, high-octane field of photography. Learn game-changing skills as you interact with creative visionaries in commercial, outdoor, and wedding photography, with special workshops for beginning photographers. This all-access pass inside the photography industry will reveal the breadth of possibilities available through your camera lens.